2-Ingredient Pie Crust. Vegan. Grain-free. Oil-free. Well, all I can say is we’ve come a long way. There are now oodles of blogs and recipes out there which feature vegan baked yummies. However, nearly ALL of those recipes contain oil (lots of coconut oil recipes floating around on the web) and many are not gluten-free. Lo and behold. A perfect crust! So simple and so nutritious. I was amazed, astounded and shocked that no one had thought of this before. It’s pretty amazing (((sigh))) if I do say so myself. my new friend… pastry and pizza roller! Mix the flax meal and the 3 TBS water together and let sit for about 10 minutes. Place almond flour in a food processor and turn on. While running, pour in the flax mixture. Pulse until the flax is completely incorporated and the dough is sticking together. Drizzle in more water as needed. The dough should be soft and smooth. 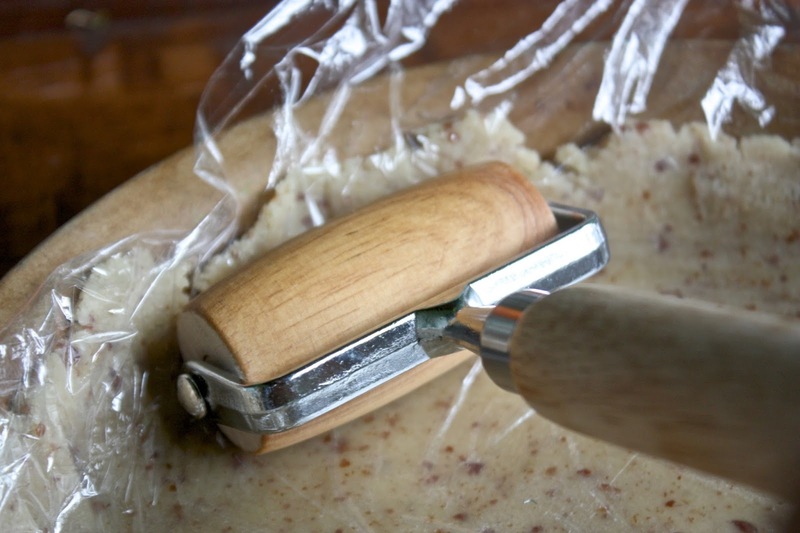 Turn the dough out onto a sheet of plastic wrap. Press it together tightly and form a disc. Roll the dough in between 2 sheets of plastic wrap, then turn it out into a pie plate. Don’t worry if it’s not perfect. You will shape it when it’s in the pie plate. Use one of the sheets of plastic wrap to smush the dough up the sides of the plate and level it down as best you can. The BEST way to do this is with something called a pastry and pizza roller (see photo above). It makes everything even and smooth. It’s very inexpensive and I highly recommend having one in your kitchen. Flute the edges using your fingers or a fork, making any design you like. Dock the crust (poke it all over with a fork). Bake for 15-20 minutes until the edges of the crust are golden. Healthy trails and happy baking! I am one of the lucky ones to experience this vegan pie crust firsthand with the beyond-description divine pie itself!! 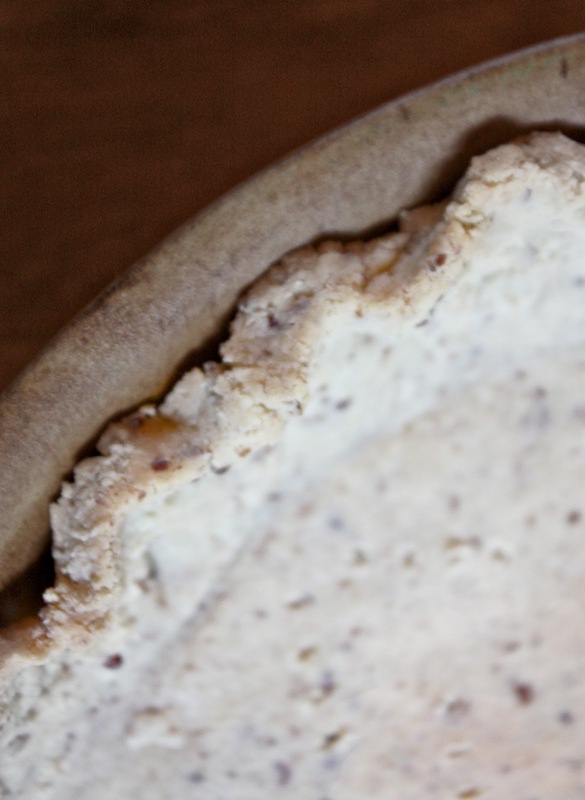 The texture of the crust is better than any pie crust ever! When I asked Helyn the ingredients I couldn't believe it. Who would have thought that just those simple vegan ingredients would result in a crust that tastes better than any other. When I asked her where she got the idea she said she just figured it out. Truly, she's brilliant. She's creating alternate recipes for so many foods that we love but have not indulged in because they're not healthy. Now we can splurge and delight in our indulgences not only guilt-free but know that we're getting real nutrition. It can't get any better! So interesting..Like you, I was a baker before going Vegan a year ago. This is a whole new world of ingredients and techniques, but I am game. I grew sugar pumpkins this summer, then roasted, pureed and froze the results. I will give this crust a try! Does the almond flour have to be blanched or could you just use regular almond flour? I don't know that I can find blanched almond flour in my area. Thanks! Just discovered your website this week. Your recipes look amazing!! 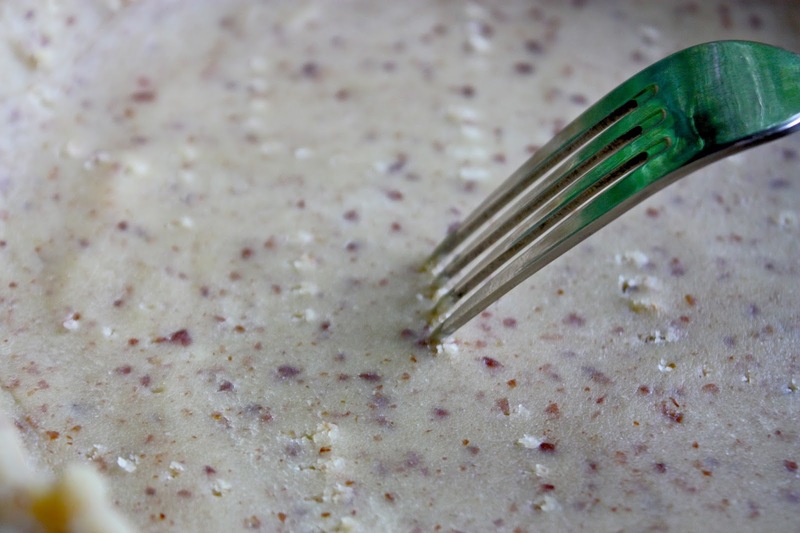 LOVE simple recipes – Unfortunately my husband is allergic to flax (I wonder if I could use a chia seed mixture?) Or if you have a better idea as a sub I'll try it – and don't fret if your suggestion doesn't work out I just don't know many replacements for flax yet in recipes. Chia and flax are pretty much interchangeable in recipes. Chia does tend to be a bit more glutenous though. Not sure about the crust, but I'd say give it a try and please let me know the outcome! Thanks!! I am also allergic to flax and was thinking of using chia seed. When you say Chia is more glutenous, how does that effect the baking? What would be the difference? I plan on trying this soon, along with your pumpkin pie recipe. Hi, this looks awesome! I can't wait to try it. I think I could use it for a savory pie recipe also, right? 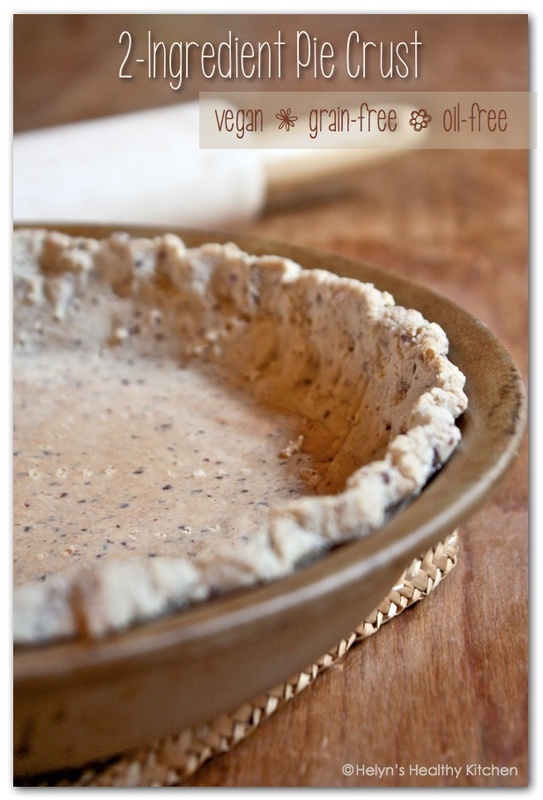 This crust is great with the vegan pumpkin pie recipe! It was a little challenging to work with though and seemed a little dry as I rolled it out. I used a pizza/pastry roller like yours and it would have been harder without it. If I was going to try to add a little (smidge) more moisture, how would you suggest; water and flax, or just water? We live in high desert, at about 4,300 ft, so I can probably get away with it. Yes I would use a bit more water AND a bit more flour as the flour contains a lot of fat from the nuts. Hope this helps! HI Helyn! How EXCITED I was to stumble onto your wonderful blog! WOWZA 🙂 Your story had me from the get go with the old baking standards we used, because girrrl, i'm completely beFUDDLED and yes, a bit p.o. that I now have to CHANGE completely everything i ever knew about baking. Whew…where to start? all this stuff about this flour, that flour, wierd ingredients that're FOREIGN to me-oyy! Also, I'm on the Swank diet for MS which is highly effective and I'm grateful, but it IS very low fat. The almond flour…hmmm. Can I use, one of the boxed (Non almond) mixes of gluten free flour I've got lingering in the freezer since my baking boycott has settled in? I guess that's a newbie's friend right? wow…I so so miss, biscotti's, all the wonderful cookies of years past…i'm just so down about all this. Thank you, for being a beacon in the night! p.s. yeah…what IS up with all the coconut oil, milk, etc. use??? Don't people REMEMBER?? this is SERIOUSLY forbidden on any low or no fat diet! Hi there! I feel your frustration! Last year I was in a complete protest about all of my baking. I barely did any, even on the holidays. On the substitution for the crust, you can certainly try the AP GF flour, though I can't guarantee a good result only because it is the fat in the almond flour that replaces the oil (butter) in the recipe :- Let me know how it comes out. I'm experimenting with other crusts and I'll be posting the ones that turn out well that are lower in fat. Happy Thanksgiving!! I've been meaning to update: I made the crust with chia seeds. I took 1TBS of chia seed and ran it through a coffee grinder. Oddly, I ended up with more than 1TBS. Anyway, I used 1TBS of the ground chia seed and ground the almond flour out of blanched almonds. I added a few dates and everything went exactly as your instructions. I pre-baked for 20 minutes. after 10 minutes of pre-bake, I covered the edges. I wish I would have covered it from the start and baked for 15 min, as the edges browned too much after I let it bake covered with the pie filling. Other than the top/edge, I think it turned out the same as using flax seed. The crust was surprisingly stable, I thought it might fall apart easily. Thanks, this is a recipe I will play around with. Thanks for the update Barbara! I've made this crust many times and it is always wonderful! I am making four of them for Thanksgiving this year and want to make them ahead of time. Have you ever tried freezing them prior to cooking them? Do you think they would do well frozen first? Or will they last in my refrigerator prior to cooking in dough form for four days? Thanks! Hi Wendy! I think it would be fine to make them ahead and keep the dough in the fridge. That's what I am going to do this year… I also have more than one pie that I'm making for Thursday. I've never tried freezing. You should probably take the dough out of the fridge about an hour before you roll it out, otherwise it may be too stiff. Hope the helps. Happy Thanksgiving! Made this crust to accompany my pumpkin pie; used 1 tbsp chia and 3 tbsp water to make a chia egg, as I usually have more luck with chia as a binder than flax. I kept the edges covered for the entire prebake and bake time with great success. My favorite thing about this pie crust is its stability – it held up wonderfully when cut & served. I added some nutmeg to give it a bit more seasonal flavor, yum. 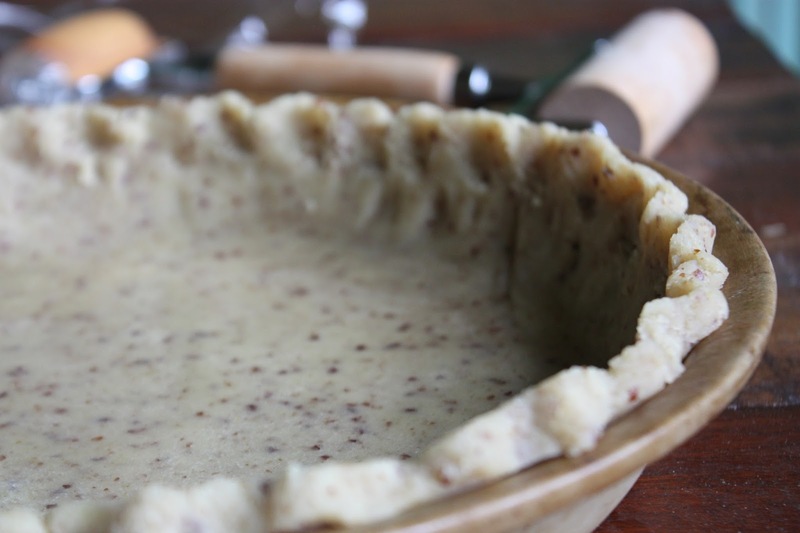 So happy to have found such a healthy & simple pie crust recipe. So happy you enjoyed it Rachel! Yes! It would work for that. I would not pre-bake though. How long would you recommend pre-baking your pie crust? Are their any special instructions for baking the center of the crust before it goes in the oven? Thank You! I'm making a peach galette. Would this work as the crust? It uses a little brown rice syrup… kind of holds things together a bit better. If you use another kind of syrup (maple, agave, etc) cut the amount in half. Brown rice syrup is VERY thick. Have fun and enjoy!!! Thank you for the fantastic crust idea. I’m wondering what you think about adding a sweetener or flavoring to it for pumpkin pie…IE do you think processing with two dates and some cinnamon would mess with it too much? Thanks! I want to fill with sweet potato pie filling and crust and filling need to cook together. The filling will take 50 mins to cook at 350 according to recipe. Should I just cover the edges of crust after the first 15 mins of baking? I am looking for ideas to make an oil free crust for a vegetable torta. The recipe I am going to use calls for bread crumbs mixed with olive oil for the crust. I was going to make flour from sllivered blanched almonds, and mix that with the bread crumbs, but am not sure what proportion to use. Looking online for an oil-free crust is difficult, at best, and your recipe was the first I found, and ironically using almond flour. I am wondering how this would work in a spring-form pan. Hi Eric. Yes, it would work in a springform pan. I have used this crust for a vegan cheesecake that I made in a springform. It’s a little tricky though getting it in there and spread around. That little took that I use (the pastry roller) makes the job a lot easier.